I love that all of these pieces are great for personal use or gift giving. Each piece can be utilized year after year, and most pieces year round. This adorable wine holder is the perfect accessory to showcase a nice bottle of wine for a host any time of year. This wooden tray is darling and I love how it can be utilized for so many things. Use it to carry around drinks, as a cheese board, as a bread plate….basically anything you can think of to put on it works! It’s crazy to look back a my Thanksgiving Decor posts from the last couple of years like this one & this & see how my taste hasn’t changed. Just goes to show all these pieces are timeless and will be great this year and years from now. 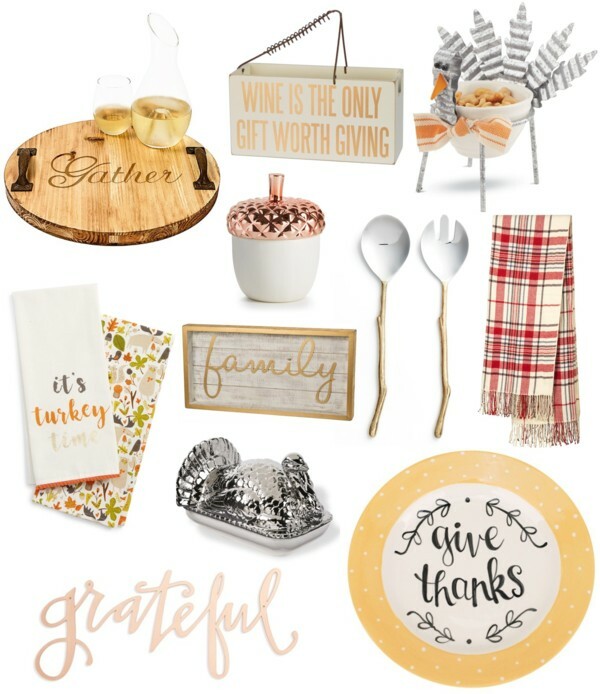 Plus, at these price points you can’t go wrong in re-vamping your Thanksgiving Decor! I’m lucky enough to have my parents come back to AZ for Thanksgiving this year. My brother will even be joining us this year and we can’t wait to see them!